When I saw this recipe, I knew I needed to make it, as soon as possible. And man, I wasn’t disappointed. It’s a bit more expensive than the usual gourmet on a budget features I write about, but spending the extra money is worth it. 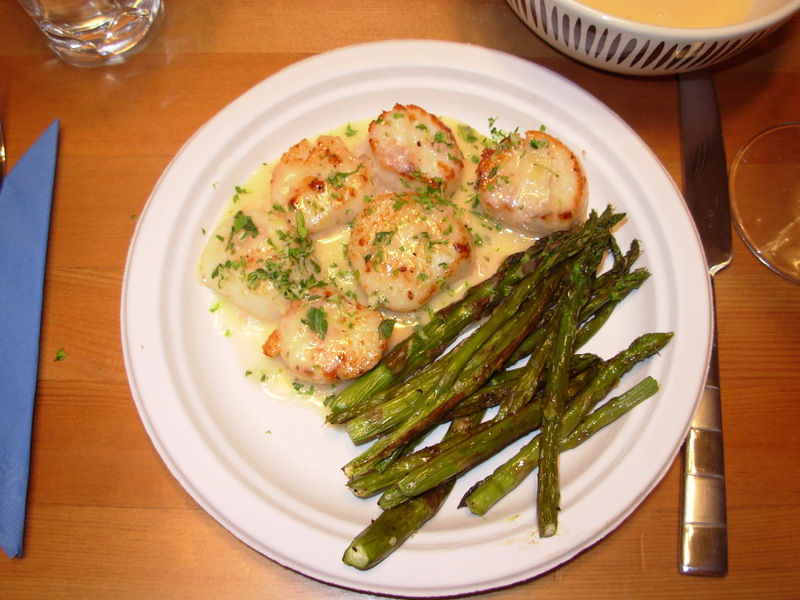 I found scallops on sale (which happens fairly often) so I feel confident using that price, making it more affordable. So this recipe fuses Asian flavors with French techniques: with the cilantro, lime, and ginger and a classic French sauce (that sounds oh so intimidating, but isn’t) – beurre blanc. A friend who isn’t terribly into cooking pretty much made the buerre blanc while I was searing the scallops, so yes, reader, you can do it too. There’s even some Italian in there with a gremolata. Budget: $18, serves 4, $4.50 a person. So I’ve been derelict in my gourmet on a budget duties. I haven’t posted since January! My bad. I struggle with what is “gourmet” enough for the blog. 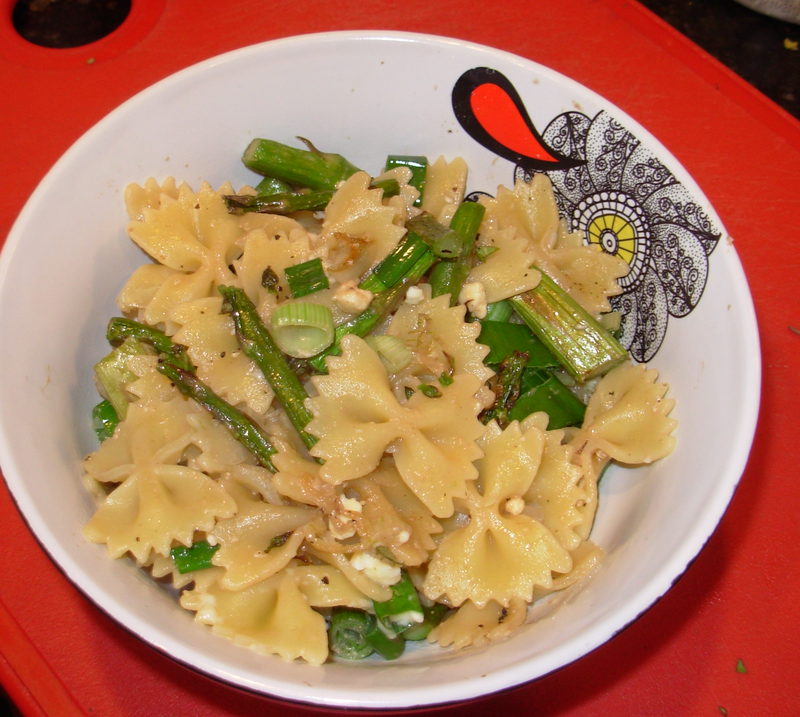 But here I have a lovely, lovely spring pasta dish (which I’ve adapted heavily from this recipe) that I made for friends and got rave reviews. It is super simple to make but tastes really wonderful. You can also make some of the components ahead of time. I’m using a lot of the stars of the farmers market this season, so make it soon! Growing up, Julia Child was always kind of a constant in my life – my family watched a lot of PBS and I saw her cooking shows often. She was kind of a given, always taken for granted, not that special. Recently, PBS has been showing marathons of her first show, The French Chef, and I’ve really come to appreciate her in a new way. She attacks cooking with gusto, isn’t afraid to make mistakes, and even back in the 60s, had a wonderful appreciation for fresh ingredients. It is striking how disarmingly charming her shows are in comparison to what you see on the likes of Food Network now, she clearly didn’t have a script and if she made a mistake, she made one, there was no do over. Makes her much more endearing than Rachel Ray or Bobby Flay, in my mind. 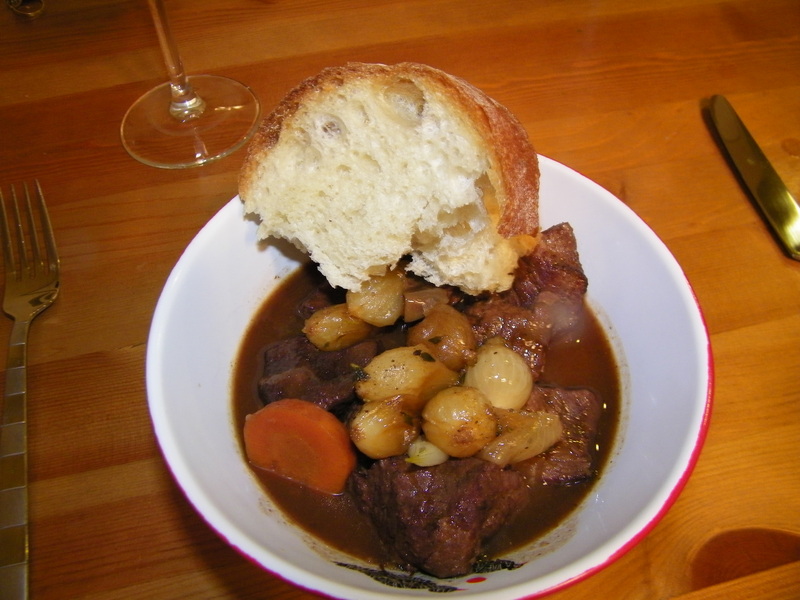 Here I present you her version of Boeuf Bourguignon, that classic French stew perfect for cold weather like this. If you’ve been tuning into my gourmet on a budget feature for a while, this will sound familiar as it’s pretty similar to coq au vin but with beef. This is going to be a bit different than my other gourmet on a budget features, as I’m not offering you one recipe as much as a bunch of ideas for a yummy, cheap, expensive-looking/tasting holiday party. Do a signature drink. With not very many ingredients, preferably with only one kind of alcohol. Have the guests bring beer or wine. I think a punch, mulled wine, or some simple cocktails will do the trick. You could go with a keg or a ton of cheap beer, but we’re trying to keep it classy here. Other cocktail thoughts: Make your own simple syrup: YES. Super easy and inexpensive (and it’s our little secret: infused simple syrups are SO easy and sound so impressive, make one). Squeeze your own orange /grapefruit/pomegranate juice: NO. More expensive and time consuming. Might not be as good but we’re on a budget here. Make smaller versions of your favorite comfort foods as appetizers, maybe something that reminds you of the holidays. Suggestions include mini potato latkes, meatballs, pizza, and eggplant parmesan (buy smaller eggplant or cut the pieces small). And the key here is MAKE, not buy pre-made. Vegetarian food is generally cheap and by serving it you cater to the vegetarians who might be coming to your party. Have a massive crudite spread that includes plenty of fresh vegetables, breads, etc. Make your own dip (in fact, make multiple dips by yourself): it will taste better than store bought, be cheaper, and impress your guests. All you need is a food processor and 5 minutes and you’ve made all of these dip recipes. Things that are already small/are on a stick are perfect. Kabobs, ravioli, etc. are all great options. Cheese and charcuterie plates are expensive. Especially when you’re me and need to buy the most wonderful, exotic-sounding cheese and charcuterie. Save it for a smaller gathering. Also: seafood is expensive, some people don’t like it, and it spoils easily. Leave it off your menu for a larger party. Don’t get too complicated (this is especially hard for me). Sometimes when things are cheap, the trade off is that you have to spend more time making it: try to strike a balance. Choose some things that are quick and some that might take longer. Don’t tackle 5 things that each take 2 hours to make. I kind of love Eric Ripert, his philosophy on food, his accent… anyway I also love his new PBS show, Avec Eric. He shows you what’s happening at Le Bernardin, visits a location where they are making something, and then goes back to his kitchen to cook what he’s been inspired by. One episode (you can watch all of them on his Avec Eric website) focused on traditions, and he cooks his grandmother’s roasted chicken recipe. Sold. So I present to you his roast chicken, with some of my own humble modifications. Budget: $16, serves four to six, so $2.67 to $4 a serving. Note: Since I bought a chicken from the farmer’s market, it was vastly more expensive than what you’d find at the grocery store. You could easily find a 4 lb chicken for $5, not the $13 I spent. Since this recipe is so simple, I feel you need to buy quality ingredients because there isn’t anything else to cover up sub-par ingredients. That being said, this would be cheaper with a bird from the grocery store. A regular feature in which I cook cheap, gourmet meals. Burnt carrot salad: best salad of your life? This salad might sound OK, something you might try, maybe. It might sound kind of ordinary, but it’s actually quite the opposite. After I made if for my boyfriend, someone I had to win a bet with in order to get him to eat a salad for the first time, he couldn’t stop singing it’s praises. “You know I don’t really love salads, I mean yours are good and all, but this is great, I would eat this every day, hands down.” Yeah, that’s a ringing endorsement from a non-salad fan. I’ve adapted this recipe from an Argentinian grilling recipe, by making it simpler. I’m not frying goat cheese, no thanks. I also like this salad because it takes an ingredient I usually use as a background flavor and brings it way up front: carrots. With this salad, you caramelize, sort of pan fry carrots to get a great crispy crust that brings out the carrots’ sweetness. Really, this is fancy dinner-worthy, cheap, and easy to make. I’d even say it’s healthy. Budget: $7 to serve 4 people. Yup, that’s $1.75 a serving, I can eat it as a main course but since it’s a salad, and you’ve saved so much money, of course it works well as a side too.